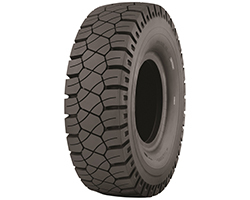 Yokohama Tire’s new RL47A™ E-4 radial tire for rigid frame dump truck applications is now available in size 27.00R49. The RL47A, designed to handle longer high-speed hauls, is offered in four different compound options: CP (cut-protected), REG (regular), CP-S (special cut resistance) and HR (heat resistant). -- Faster/longer hauls are in store thanks to the precise, heat dissipation grooves strategically placed across the tread. Additionally, specially designed thermal reduction architecture on the shoulder block provides extra heat dissipation. -- Longer service life and excellent cut resistance are insured via the larger, flatter footprint which distributes weight more evenly. For more information of Yokohama’s full line of OTR tires, visit https://www.yokohamaotr.com/otr/resources.